Select Adwaita theme in appearance settings. Drag an application item on to the panel to create a launcher. Right click the launcher and open properties. Change the icon to the circular whisker menu icon. The icon will be rendered at a different size to the whisker menu icon. Again, this happens regardless of the panel size. The icon is consistently 2-3 pixels smaller, but unlike with the Applications Menu, the icon is shrunk instead of clipped. This screenshot shows the panel in 16.04 vs the panel in 18.04. Same panel size, theme, icons, font, and DPI. With greybird everything is reversed. The Application menu/launcher/directory icons fill the panel, but the whisker menu icon is smaller. No clipping that I can see. Adwaita has some aggressive padding in xfce4-panel. There was a update in whisker fairly recently that forced the icon padding to 0. There's probably some leftover patches in Greybird that also adjust this padding. I have a similar problem. In my applications menu the icons are too big. Not all but some of them. Also the tooltips of starters in the panel have too small or too big icons in some cases. Please have a look at the screenshot attached. I am using the numix theme with elementary xfce dark symbols but it doesn't matter which theme or symbols I use. I have Xubuntu 64 bit x86 version 18.10. Maybe the cause is the same. Let me know if I should open a seperate bug. I also noticed that the audacious icon is clipped which is also visible in the screenshot I uploaded in my post above. Manuel, that looks like https://bugzilla.xfce.org/show_bug.cgi?id=13785. I am not sure about the tooltip icon size which may need a separate patch. I cannot confirm this with xfce4-panel 4.13.4 on cosmic with Adwaita. See the attached screenshot. 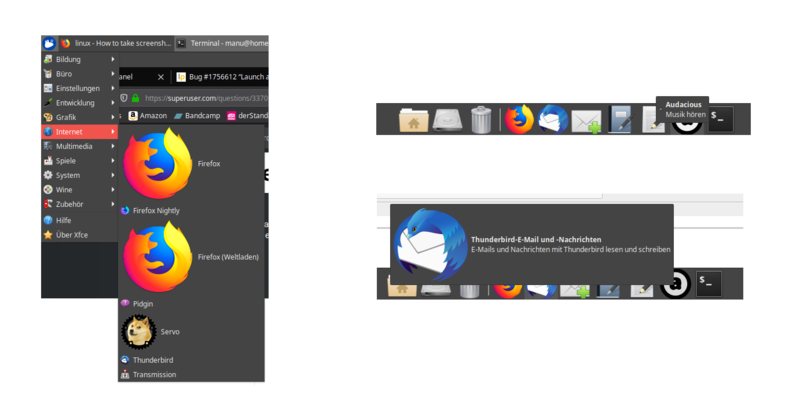 On the left is whiskermenu, on the right a launcher (firefox, but with the whiskermenu icon), both at the same size.